Annie Wells 'sought political advantage' by commenting on report before it was published. A Scottish Conservative MSP faces being suspended from Holyrood for five days. Members of the Scottish Parliament's standards committee have agreed sanctions should be imposed on Annie Wells after they agreed she had "sought political advantage" by making comments on a report before it was published. The ban still has to approved by MSPs in a vote, with Ms Wells, the Scottish Conservative equalities spokeswoman, to be barred from proceedings after that. It comes after SNP MSP Gail Ross complained the Tory had "sought political advantage by making advance public comment" on a report by the equalities and human rights committee on the issue of prisoner voting prior to the report being published. 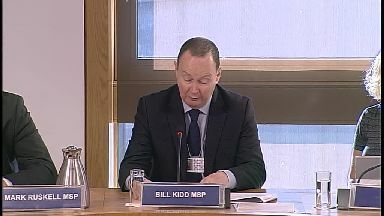 Bill Kidd, convener of Holyrood's standards committee, said Ms Wells had breached the Code of Conduct for MSPs by doing so. He said: "The committee considers that the breaches justify the imposition of sanctions on Annie Wells." In response to the committee's decision, Ms Wells said: "Numerous media outlets contacted our office seeking comment on a story on the front page of a national newspaper that morning on prisoner voting. "So I responded to that, as every MSP would, by issuing a statement to them reiterating my opposition to allowing prisoners voting rights. "My response did not contain details of the report that weren't already known, nor was I responsible for the original leak of the document to the paper, and we still don't know who was. "Indeed, I did not receive the final report until after it had featured in the national media. "I will continue to work on behalf of my constituents and I will continue to oppose giving prisoners voting rights." Two former MSPs, Liberal Democrat Mike Pringle and Conservative Brian Monteith, were both banned for a week after they leaked information.